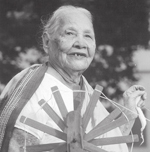 Saraswathi Gora (1912–2006) was an Indian social activist. Notable as the leader of the Atheist centrefor many years, she campaigned againstuntouchability and the caste system. Born on September 28, 1912 at Vizianagaram in Andhra Pradesh, she got married at the age of ten to Gora. Along with her husband, Saraswathi Gora established Atheist center with the intention of promoting human values based on atheism, rationalism and Gandhism.A political activist of India's freedom movement, she was imprisoned during the Quit India Movement. She promoted intercaste and casteless marriages, worked to abolish child marriages, debunks superstitious beliefs by holding firewalking demonstrations and debunking other "miracles" and educated against belief in witchcraft and sorcery. In 2001, she was selected for the BasavaPuraskar, conferred by the Karnataka Government. She is also the recipient of the G.D.Birla International Award for Humanism ;the Jamanlal BajajAward(1999); the Janaki Devi Bajaj Award; and the PottiSriramulu Telugu University Award. In 2011 the Postal Department of Government of India released a postage stamp commomerating Saraswathi Gora's birth centenary.